1. 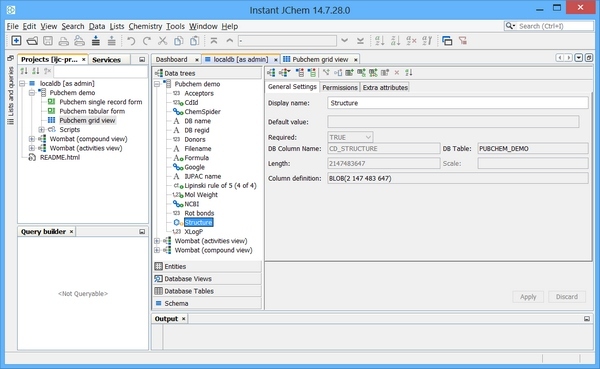 Administer a table in Oracle using Instant JChem. 4. Define an approach to synchronise columns for which the source data is subsequently updated, implemented as a "BEFORE UPDATE" trigger. This operation is required for example after a re-standardizaion operation is applied on a given JChem table. It is hoped that these examples can be used as templates for further bespoke index based on Chemical terms or other calculated columns. In the case of Oracle "instant client" is available for download and will contain the client side SQLPLUS tool which can connect to the Oracle instance and issue commands. First, we need to administer a JChem table. One method to do this is via Instant JChem (IJC) Desktop application. 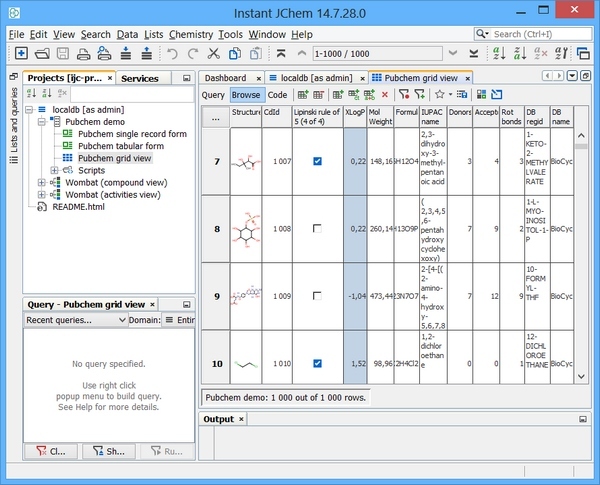 Assuming we have an existing Oracle connection / schema established in IJC then we can add a new JChem table easily. Right click on your schema and choose "new structure entity table". 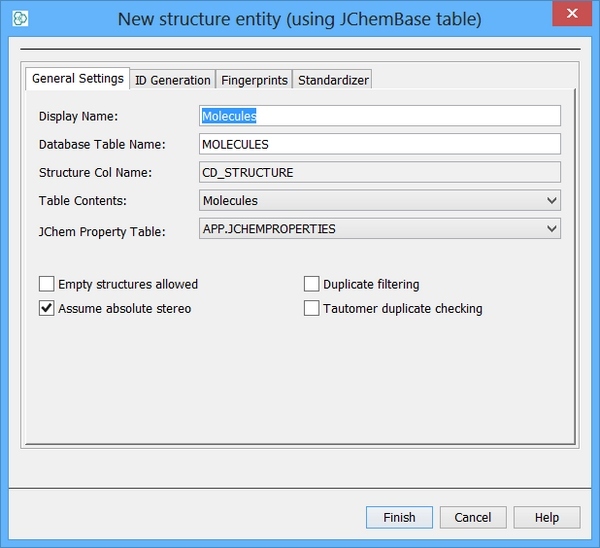 At the entity type drop down choose "New structure entity (using JChemBase table)". Assuming we accept the defaults - we should see the window below and the subsequent examples assume a table name of "STRUCTURES"
An additional text based column is now required to store the character based key and this can be created using IJC. Right click on your table and choose "Edit data tree" Left click on "New standard field" and choose "Text field". You can also edit your display name and column name. In this case the column is named "TARGET_KEY". 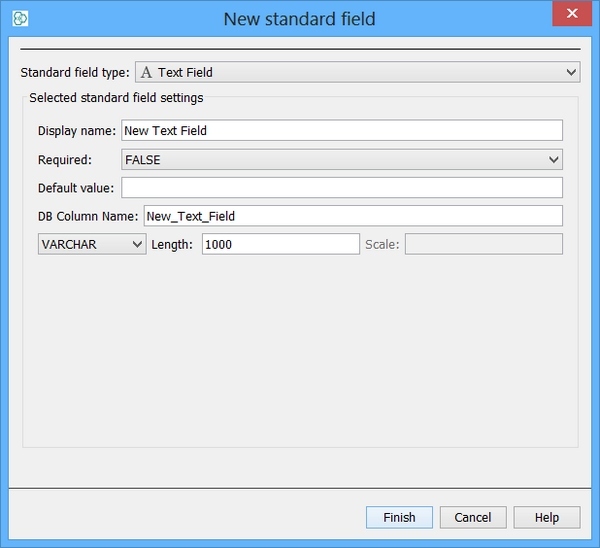 The Text field maps directly to a column of type VARCHAR2 in Oracle. In order to create an integer based sequence in Oracle the following syntax is required and can be executed using SQLPLUS client which Oracle provides. The sequence methods "nextval" and "currval" can be used to obtain next and current numbers from an existing sequence object. Since the sequence is integer based, a character coversion function is required. In order to create derivations from existing data an individual or set of triggers can be used. In this example a single drug like filter column "Lipinski_5" is created and populated for any rows that are added to a JChem table. The IJC boolean type actually maps to a NUMBER type in Oracle.